Digital Equipment Corp. cofounder Harlan Anderson, who just turned 80 this month, is publishing his memoirs next month, reports Scott Kirsner in this column. The book is called Learn, Earn & Return: My Life as a Computer Pioneer, and is being published by Locust Press. And Anderson has also started blogging recently. In the book, Anderson writes for the first time about his experiences at DEC during the company’s initial decade, and the events that led to his leaving in 1966 — the same year that DEC became one of the most profitable initial public offerings in Wall Street’s history. Anderson is candid about his relationship with DEC co-founder Ken Olsen: and later, how Olsen’s autocratic leadership style alienated some of the company’s most talented engineers, and ultimately contributed to Anderson’s departure. He also discusses how American Research and Development, the venture capital firm run by Georges Doriot, financed this groundbreaking startup. Trust may be the most scarce commodity around right now. Wall Street can’t be trusted much these days, thanks to the financial crisis and a guy named Madoff. A lot of corporate executives haven’t done much to inspire trust. People have never much trusted their politicians. And even seemingly harmless athletes are finding ways to lose the trust of the public. So who can you trust these days? Friends and family, of course. But beyond that close circle I would say that in the public sphere entrepreneurs still deserve to be trusted. Entrepreneurs represent the very best of America: They work very hard, they often develop products and services that improve our lives, and they create jobs that help our communities and the nation at large. So as we continue to try to dig ourselves out of this deep hole, let’s try to keep finding ways to help entrepreneurs and small businessmen and businesswomen. Entrepreneurship flourishes in a climate of economic freedom, with low taxes and little regulation. You don’t hear too much about entrepreneurs in the discussion about the stimulus package and in talk about the economy. Wall Street firms and banks and Detroit seem to hog most of the attention. But it’s the entrepreneurs and small businesses that will likely play a key role in reviving our animal spirits and lifting us out of this recession. Thomas Friedman of the New York Times wrote a great and timely column today related to this issue when he slammed the Senate’s version of the stimulus, which banned banks and other financial institutions that receive taxpayer bailout money from hiring high-skilled immigrants on temporary work permits known as H1-B visas. More than half of Silicon Valley startups were founded by immigrants over the last decade. It is dumb and shortsighted to keep these industrious and smart folks out of our country–a subject I’ve written about before at BusinessWeek. General Doriot, the focus of my book, was all about supporting entrepreneurs–from across the globe. The Doriot bucks above inspired me to write this post. Doriot used to give out this fake money at the annual meetings of his venture capital firm American Research & Development. last year, Scott Kirsner of the Boston Globe was kind enough to send me a few of them. And now I am happy to share them with you. Scott Kirsner wrote a great story about Doriot and my book Creative Capital in today’s Boston Globe. He covers the launch of the book and the key arguments I make in it; he chronicles Doriot’s influence; and he even mentions that American Research and Development still exists! Click here to read the whole 1162-word piece in his Innovation Economy column. I’m totally pumped since this is the first major newspaper to write about the book–and because the Boston Globe is the perfect paper to break the story. When Doriot was in his heyday during the 40s/50s/60s operating out of the John Hancock Building, the Globe wrote about him quite often. “Without him, Digital Equipment Corp. might never have gotten started, and the electronics-testing company Teradyne Inc. might not have survived beyond infancy. He backed an oil rig-manufacturing company run by George H.W. Bush. The current Secretary of Energy, Samuel Bodman, once worked for his Boston firm. And a half-century ago, he put $50,000 into a company called Ionics Inc. that was trying to find new ways to desalinate seawater; GE bought the company in 2004 for $1.1 billion. 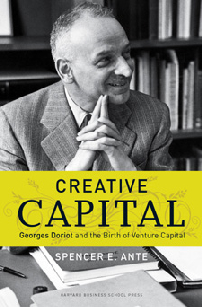 Georges Doriot is the forgotten grandfather of the modern venture capital industry. His Boston firm, American Research and Development, or ARD, helped lay the foundation for the Route 128 technology cluster. In connection with his forthcoming story on Creative Capital in The Boston Globe’s Sunday’s Business section, Globe columnist Scott Kirsner produced a video about American Research and Development and one of the entrepreneurs ARD backed: Adage’s Tom Hagan. Adage was a Cambridge electronics company. Check out the video here. But on the other hand, Hagan argues that ARD retarded the growth of the New England venture communtity. His thesis is that by only investing $70,000 into Digital Equipment Corp., ARD created the impression that startups did not need a lot of money to build a business. While it is true that Doriot was criticized by some people for not investing large amounts of money in a few companies, I have to respectfully disagree with Hagan’s main point that ARD helped to retard the growth of New England venture capital. It is just not true. Without ARD, venture capital in Boston might not have ever taken off. ARD pioneered the model, which inspired many, many people in New England to enter the venture capital business and invest in startups. And one of ARD’s spin-offs, Greylock Capital, is one of of the best VC firms operating in New England, if not the best. Second, it is NOT TRUE that ARD only invested $70,000 in Digital. In 1958, ARD invested another $30,000 in Digital to provide working capital for Digital’s expanding operations. And in 1962 ARD invested another $300,000 in Digital. That comes to a total of $400,000–a pretty significant sum even for the early 1960s. ARD was not just an early stage VC–they often invested multiple times in the companies they backed. Third, it’s absurd to say that ARD had anything to do with Boston’s rep for being less adventurous. ARD always thought in big and bold terms and took enormous risks. I say blame the generation of Boston-area VCs after Doriot for not being more adventurous–and for not focusing more of their energy and time in Northern California where the microprocessor and biotechnology revolutions exploded. What do you think? I am really curious to hear from other New England folks on this topic. One of the surprising results generated from Googling “Creative Capital and Spencer Ante” was my discovery of Scott Kirsner’s blog, Innovation Economy–an offshoot of his column in the Boston Globe. A few months ago, Scott was nice enough to publish a post about my book. I’ve been a fan of Scott’s work over the years. He’s one of the smartest tech writers working these days. And his blog is pretty cool, with a focus on the New England tech scene.